Deletion techniques are the most basic and traditional techniques to handle missing data and are most common in statistical software. Two deletion methods are listwise deletion and pairwise deletion. With listwise deletion, or complete case analysis, all cases with missing scores on one or more variables are excluded from the analysis. The advantage of this method is that the remaining dataset is complete. However, this complete dataset has a reduced sample size and power, caused by the loss of the incomplete cases. Also the chance of having a biased dataset is substantial if data is not MCAR. 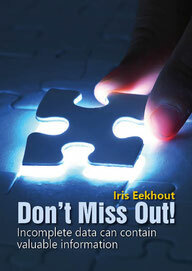 In most situations, the disadvantages of listwise deletion far outweigh its advantages (Enders, 2010). Nevertheless, this method is still most frequently applied in many fields of research, for example in medical and epidemiological studies (Eekhout et al, 2012). Furthermore, this method is also the default option in many statistical procedures in many statistical software packages. In pairwise deletion, or available case analysis, incomplete cases are deleted on an analysis-by-analysis basis. Consequently, any given case may contribute to some analyses but not to others. In this approach the sample size will remain the same for some analyses and will be reduced for others. The main problem in this method is the assumption of the MCAR mechanism to produce unbiased estimates (Baraldi & Enders, 2010), but also the inconsistency of the sample size can lead to problems in computing standard errors.